From the Windows Vista desktop, navigate: Start > (Settings) Control Panel > View network status and tasks (Network and Sharing Center) > Manage network connections. From the Windows 7 desktop, navigate: Start > (Settings) Control Panel > View network status and tasks (Network and Sharing Center) > Change adapter settings. From the Windows 8 desktop, hover the mouse in the bottom-right corner to get the charms menu. Navigate: Settings > Control Panel > (Network and Internet) View network status and tasks. From the Windows 10 desktop, navigate: right-click Start > Control Panel > Network and Sharing Center. 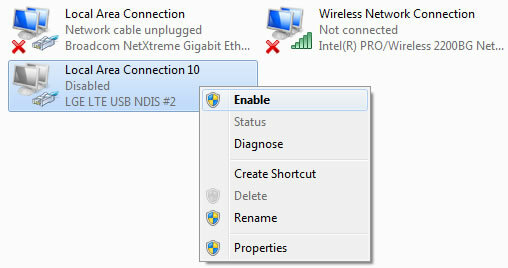 Right-click the 4G LAN adapter then click Enable / Disable.